The way Democrat partisans allege Russian collusion where it isn’t and turn a blind eye where it is threatens democracy and the rule of law. These globalists are also promoting lawlessness in Guatemala with U.S. taxpayer dollars. Meanwhile, they are hiding collusion between Russia and the UN International Commission against Impunity in Guatemala (CICIG). For two years, no evidence has emerged indicating President Donald Trump illegally conspired with Russia. However, compelling evidence has emerged of high-level Obama administration abuse of power during and after the 2016 election. Regardless, congressional Democrats are doubling down on their efforts to prove the former and stop investigations into the latter. On April 27, the Helsinki Commission in the House of Representatives held a hearing about the persecution of the Bitkovs—a Russian family in Guatemala—by the CICIG at the behest of Vladimir Putin’s cronies. After the Russian government forced the Bitkovs out of their business, they fled. At a price of $150,000, Cutino International helped Igor Bitkov and his family obtain new identities in Guatemala. In 2015, the CICIG had them arrested and subjected to brutal treatment for using false documents. Bitkov was incarcerated for nearly three years awaiting trial. State-owned Russian VTB Bank, headed by a U.S.-sanctioned Putin henchman, was a co-plaintiff. The CICIG, in a globalist alliance with the U.S. State Department, has a majority of the Constitutional Court (CC) in its pocket. Former Ambassador to Guatemala Todd Robinson placed the subservient allies on the court. Two days before the Helsinki Commission hearing on April 27, the CC confirmed an appeals-court ruling that the Palermo Convention applies to the Bitkovs. This effectively absolves them of the charges and ends the case. Guatemalan lawyer Alfonso Carrillo, who works closely with the CICIG, then asked financier and Bitkov advocate Bill Browder unsuccessfully to get the hearing cancelled. Browder was a victim of Putin’s persecution—which included the assassination of his lawyer—and the chief advocate for the 2012 Magnitsky Act. Revelations in the hearing led Senator Marco Rubio (R-FL) to place a hold on some U.S. funds set for the CICIG. However, never-Trumper Senator Bob Corker (R-TN), aiding the CICIG and Russia, later had the funds released. In March, the Wall Street Journal began to expose CICIG corruption in the Bitkov case. Four Guatemalan civic organizations also released a report detailing CICIG history, actions, and inactions. The CICIG has coerced votes in the Guatemalan Congress, false testimony against political targets, and illegal judicial rulings. Senator Roger Wicker (R-MS) gave a scathing and accurate assessment of the CICIG on the floor of the Senate. In a House Foreign Affairs Committee hearing, Representative Chris Smith (R-NJ) asserted Russian collusion with the CICIG against the Bitkovs. Ambassador Kenneth Merten of the State Department, however, testified they know of no evidence to support Smith’s claim. The globalist alliance had the CC issue its order freeing the Bitkovs to avoid negative publicity about the CICIG. After the hearing, a lower court judge openly disobeyed the CC resolution and ordered a new trial for the Bitkovs on the same charges related to false documents. The CC blatantly contradicted itself by accepting the judge’s action. The Wall Street Journal, Browder, and Bitkov all speculated that Russia’s power over the CICIG was so great that the U.N.-appointed commission couldn’t permit the family to go free, as the law required. Rubio and Smith are pressuring the globalist alliance to desist in their anti-Bitkov efforts. The globalist alliance pulled out all stops to maintain illegitimate CICIG power over Guatemala. Among many statements and letters, 23 House and Senate Democrats praised the CICIG to Secretary of State Mike Pompeo for fighting corruption and impunity despite contrary evidence. On September 4, the Guatemalan government, according to international law, notified the United Nations that CICIG Commissioner Iván Velásquez was unacceptable and would not be allowed to return to Guatemala. President Jimmy Morales requested a new commissioner. 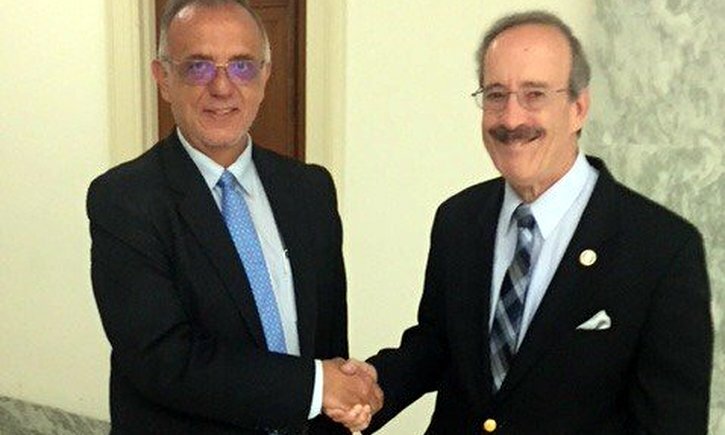 On September 6, House Foreign Affairs Committee ranking member Representative Eliot Engel (D-NY) praised and met with Velásquez in person. Judicial Watch reported, “As a lawyer in Colombia, Velásquez aligned with the FARC, the violent Marxist guerrilla.” Representative Norma Torres (D-CA) also traveled to Guatemala and, with U.S. Ambassador Luis Arreaga, met with high-ranking government officials and backed the CICIG. In the new Bitkov trial, the court rejected defense evidence showing the complicity of Cutino International and the former immigration officer who signed the Bitkov documents. If the CICIG were adhering to its mandate and the law, it would pursue the criminal structure that took Bitkov’s money and provided the documents. Bitkov was convicted on December 28, sentenced to seven years in prison, and ordered deported to Russia. The conviction is directly attributable to Democrat support for the CICIG and the coopted high court. They could have blood on their hands if Bitkov is deported to Russia. Democrats and State Department globalists have sent the message to Guatemalans that the CICIG is untouchable and able to violate the law and punish anyone who stands in its way. This contributes to the CICIG’s efforts to steal Guatemala’s 2019 presidential election, which would further harm Guatemala and the United States. Democrat support for the CICIG and Special Counsel Robert Mueller has the same strategy. They persecute their enemies and protect their allies at all costs, while propagandists promote them as pure and pursuing corruption. The difference is the CICIG and the coopted judiciary have wider latitude because Guatemala has never had the rule of law. The United States will become Guatemala if it continues on this path. Steve Hecht is a businessman, writer, and film producer, born and raised in New York. He has lived and worked in Guatemala since 1972. He holds a Bachelor of Arts in Economics and a Master of Business Administration in Banking and Finance, both from Columbia University. He has worked on development projects in Guatemala to help the country leave its underdeveloped state and reach its great potential. Realizing the misconceptions prevalent about Guatemala and Latin America in the outside world, he has written for the Washington Times, Daily Caller, Fox News, Washington Examiner, Frontpage Mag, New English Review, PanAm Post, and PJ Media and appeared as a guest on national American media programs including the Lars Larson Show. Steve’s reporting has included meeting with coyotes, the human smugglers who have ferried millions of illegal immigrants into the United States via Guatemala’s 595-mile border with Mexico. Support our work to unmask impunity and promote the rule of law. By donating, you will elevate press freedom and help us cover events ignored by the mainstream media. Design by Antigua Report. Powered by WordPress and Gambit.